KNOXVILLE ​- More than 8,000 of the most creative students from more than 15 countries are headed to Knoxville for the 19th annual Global Finals tournament, taking place May 23-26, 2018. As the culminating event of the ​Destination Imagination​(DI) season, Global Finals provides student finalists the opportunity to showcase their top-scoring innovative solutions in the areas of STEAM (science, technology, engineering, arts and mathematics), as well as service learning and improvisation, at the world’s largest celebration of creativity. Each year, more than 150,000 students across the U.S. and in 30-plus countries participate in the DI Challenge Experience. Open to kindergarten through university level students, the Challenge Experience brings teams of students together to solve one of seven Destination Imagination ​Team Challenges​. These academic, project-based Challenges blend STEM learning with the arts and encourage students to think critically and creatively, collaborate with others, and problem solve — skills that will prepare them for the future workforce and beyond. “We are extremely excited to see the creativity, collaboration and hard work from some of the most brilliant young minds around the world,” said Michele Tuck-Ponder, Interim CEO of Destination Imagination, Inc. “These are tomorrow’s innovators and leaders, and thanks to our sponsors and partners, we’re able to give them an international platform where they can showcase their innovative Challenge solutions, expand their skill sets, and interact with students from different cultures all in one amazing place." During a season of presenting their cutting-edge solutions at regional and affiliate (state or country) tournaments, new and returning DI teams’ ultimate goal is to compete on a world-stage at Global Finals. Team solutions were assessed by a panel of trained appraisers, ranging from educators to entrepreneurs to engineers, and were scored on a variety of elements, including originality, workmanship, presentation and teamwork. 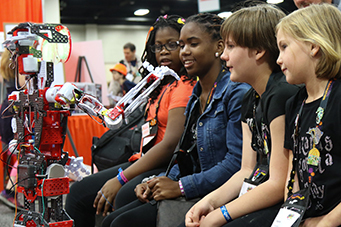 In addition to the tournament, Global Finals 2018 includes an Innovation Expo, designed to engage and inspire students with hands-on and minds-on activities. This year’s Innovation Expo includes activities from sponsors and exhibitors such as NASA, Space Camp©, Oracle Academy, CASIS, Pitsco Education, and Higher Orbits. For more information about Global Finals and for the full agenda, visit www.globalfinals.org​. Destination Imagination, Inc. is a 501(c)(3) volunteer-led non-profit organization whose purpose is to inspire and equip students to become the next generation of innovators and leaders. The organization is a leader in project-based learning experiences, where students work together in teams to solve open-ended STEAM (science, technology, engineering, arts and mathematics) and service learning Challenges and then present their solutions at tournaments. Founded in 1982, Destination Imagination has impacted more than two million students. To learn more, please visit destinationimagination.org.